Before discussing current evidence, it is important to mention historical work on Precambrian life. Although there were some earlier reports of Precambrian life, the work of Stanley Tyler and Elso Barghoorn (FIG. 2.3) on the Gunflint Iron Formation (Gunflint chert) of the Canadian Shield provided the first detailed, irrefutable evidence for life in the Precambrian. These researchers began with a preliminary report on the organisms (Tyler and Barghoorn, 1954) and the description of coal from the same area (Tyler et al., 1957). A detailed morphological analysis of the organisms themselves appeared in 1965 (Barghoorn and Tyler, 1965). At the time, the diversity of organisms they described from this 1.9Ga site (Paleoproterozoic) must have seemed phenomenal. Their work was quickly followed by other reports of Proterozoic fossil organisms and eventually by the discovery of Archean microorganisms. The Gunflint biota will be discussed in more detail later (see section on "Paleoproterozoic" below). evidence has its own positive and negative aspects, which we will try to address on a case-by-case basis. The majority of the research on early life comes from three localities: (1) Warrawoona Group in the Pilbara Craton, Western Australia (3.515-3.427Ga); (2) Barberton Greenstone Belt, Kaapvaal Craton of South Africa and Swaziland (3.55-3.33Ga); and (3) the Isua Group in southwest Greenland, including the island of Akilia (3.9-3.7Ga). The geochemical evidence for life in the Paleoarchean continues to increase. Although some of the records remain controversial, the increasing number of records from various sources, such as biomarkers, stable isotopes of carbon and sulfur, and metal isotopes, supports the hypothesis that life began on Earth soon after the formation of continental crust and oceans. The major problem with the Archean signature of life, however, is the nature of these very old rocks themselves. Many have undergone tectonic events and all are metamorphosed to some extent, which can have a significant effect on isotopic signatures. In addition, even very hard cherts are porous to some degree, so contamination after deposition must also be taken into consideration. Evidence points to the earliest life, probably consisting of anaerobic, chemosynthetic microorganisms. Free oxygen is not found in appreciable amounts until the Paleoproterozoic, so these early microorganisms are believed to have lived in a reducing environment. Shen et al. (2001) reported on the presence of microscopic sulfides in ~3.47Ga barites from the Dresser Formation (3.515-3.458Ga), North Pole, Australia. The 634S isotopic evidence supports the presence of sulfate-reducing microbes. Based on molecular phylogenetics of extant Archaea and Bacteria, sulfate reduction is thought to be an ancient metabolic process (Shen and Buick, 2004). Although Philippot et al. (2007) disagree that these sulfides were formed by sulfate reducers, they do acknowledge that they are biogenic, that is, produced by organisms. They conclude that the mix of sulfur isotopes points to a microorganism that was metabolizing elemental sulfur rather than sulfates. Another important source of Paleoarchean rocks is the Barberton Greenstone Belt of South Africa and Swaziland. Using a combination of petrographic observations, X-ray mapping of elements, and carbon isotope measurements, Banerjee et al. (2006) described 3.5-3.4Ga micron-scale tubular structures as evidence of life, although aspects of this research are controversial (Kerr, 2004). The tubes have organic carbon associated with them, as well as low 613C isotopes indicative of life. The samples come from subaerial volcanic rocks, including pillow lavas—not a typical site in which to look for early life. The tube morphology and texture, however, are almost identical to etching seen in the glassy edges of modern pillow lavas, at least some of which are microbially mediated (see also Furnes et al., 2004). Similar structures have been described from 3.35 Ga rocks from Western Australia (FIG. 2.4 ) (Banerjee et al., 2007). A range of organisms have been found around modern hydrothermal, deep-sea vents, including members of both the Bacteria and the Archaea, although the Archaea appear to dominate at very high temperatures. Some of these are sulfate reducers and obligate chemoautotrophs (Reysenbach and Shock, 2002), but methanogenic microbes are also found. Studies on modern basaltic glass show that the presence of microbes greatly enhances weathering and may produce different chemical products than abiotic weathering (Staudigel et al., 1998). including Fourier transform infrared, Raman, and NMR (nuclear magnetic resonance) spectroscopy, they found similarities between this Archean kerogen and younger, Mesoproterozoic kerogen (~1.45Ga), which is known to be biogenic. Based on these results, Marshall et al. (2007) suggested that the Strelley Pool kerogen is also derived from organic matter that had a biogenic origin. After analyzing hundreds of specimens from the North Pole area using petrography and isotope analyses, Ueno et al. (2004) concluded that the kerogens in their samples could have been produced by anaerobic chemoautotrophs, including metha-nogenic microbes. Their evidence suggests that the organic matter did not come from aerobic photoautotrophs, such as photosynthetic cyanobacteria (Chapter 3). In another study on fluid inclusions in quartz from the ~3.5Ga Dresser Formation (North Pole), Ueno et al. (2006) report the presence of microbial methane (CH4). The methane is highly depleted in 613C isotopes, suggesting it was produced by methanogenic microbes. Controversy has surrounded the possible evidence of life in rocks from southwest Greenland ever since graphite and microfossils (see below) were found there in the late 1970s. As newer geochemical techniques have become available, the interpretation of Isua rocks has recently generated a new wave of controversy. Graphite was described from Isua rocks almost 20 years ago (Schidlowski, 1988) and more recently from the island of Akilia (Mojzsis et al., 1996), which is dated as ~3.825Ga (Manning et al., 2006). The graphite occurs as inclusions within apatite (a calcium phosphate mineral) and was interpreted as being biogenically produced, based on the isotopically light (i.e., more negative) carbon isotopes obtained from it. Much of the controversy centers around the exact strata from which samples were obtained, as the rocks are exceptionally complex; additional sampling has yielded no graphite (Lepland et al., 2005). Others have suggested that the carbon entered the deposits at a later time than the formation of the rocks themselves (Fedo and Whitehouse, 2002). McKeegan et al. (2007) used Raman spectroscopy to examine the same samples used by Mojzsis et al. (1996) and concluded that graphite is completely contained within apatite, and that it is isotopically light carbon. This supports the claim that the carbon represents a biomar-ker for ancient life. For a review of the controversy and the issues involved, see Eiler (2007) and references cited therein. Although it is clear that life was present in the Paleoarchean, the fossil evidence for life at this time is difficult to interpret due to the microscopic nature of the organisms, a lack of diagnostic and preservable morphologic features to distinguish them, and the changes that have occurred in these ancient rocks since they were first formed. For these reasons, there have been a number of reports of Archean unicells, filaments, and other growth forms that have later been reinterpreted as representing abiogenic structures (i.e., not formed by living organisms). These structures have been labeled in the literature as either pseudofossils (formed abiotically) or dubiofossils (uncertain origin). ISUA GREENSTONE BELT, GREENLAND. Perhaps one of the most discussed examples of a dubiofossil was the description of isuasphaera, a yeast-like microorganism found in 3.8-3.7Ga Isua Greenstone Belt metamorphic rocks from Greenland (Pflug, 1978). Isuasphaera consisted of spherical-elliptical structures, some of which gave the appearance of budding yeasts. The description of these complex, eukaryotic organisms from some of the oldest rocks on Earth generated a great deal of controversy at the time, which extended to analyses of amino acids supposedly preserved in these rocks. Bridgwater et al. (1981) described a broad range of diameters for the spherical bodies in these rocks and suggested that the structures represent limonite-stained, fluid-filled inclusions in the metaquartzite rather than microorganisms. 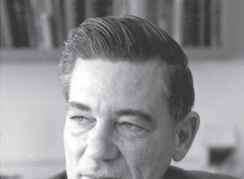 Their hypothesis was widely accepted (Bridgwater et al., 1981; Schopf and Walter, 1983). More recently, Appel et al. (2003) laid the matter of Isuasphaera to rest. Appel was the one who originally collected the samples containing the spherical bodies, and he and his team were subsequently able to reexamine the exact site and show that the rocks in this zone (metamorphosed chert) had undergone extreme stretching deformation. Since the spherical bodies could not have been preserved through this event, these researchers concluded that they were formed as a result of pre-Quaternary weathering. WARRAWOONA GROUP, AUSTRALIA. A similar controversy has developed over the rocks and vestiges of life from the Warrawoona Group in the North Pole Dome area of Western Australia. Currently, the oldest microfossils come from this area, in the Apex chert (~3.465Ga), now part of the Salgash Subgroup of the Warrawoona Group (Van Kranendonk et al., 2002). The Warrawoona Group rocks (3.515-3.427 Ga) occur within the East Pilbara terrane and contain both stromatolitic deposits (with and without microfossils) (Lowe, 1980; Walter et al., 1980; Walter, 1983; Allwood et al., 2006, 2007) and cherts that contain preserved microfossils. The relatively high diversity of the fossil assemblage from the Apex chert (Awramik et al., 1983; Schopf and Walter, 1983; Schopf, 1993 and references cited therein) is noteworthy and provides evidence that life may have arisen earlier than 3.556 billion years ago. This silicified microbiota includes four types of filamentous bacteria, colonial unicells, organic spheroids, and radiating filaments, which are hypothesized to have been living in a shallow-water environment. The spheroids and radiating filaments are now regarded as only possible microfossils or dubiofossils. In total, 11 species of filamentous organisms are known, which range from 0.5 to 19.5 pm in diameter; although the smaller diameter fossils are probably filamentous bacteria, the larger ones are most comparable to cyanobacteria. The four types of simple filaments in this microbiota include (1) very narrow forms, Archaeotrichion, that range from 0.3 to 0.7 pm in diameter and up to 180 pm long; (2) possibly septate filaments, up to 340 pm long (0.8-1.1 pm in diameter), Eoleptonema; (3) large, tubular sheaths 3-9.5 pm wide and up to 600 pm long (Siphonophycus); and (4) large septate filaments, up to 120 pm long, which consist of mostly isodiametric cells 4-6 pm in diameter (Primaevifilum) (FIG. 2.5). Based on morphology alone, these microorganisms can be compared with a large number of living bacteria and cyanobacteria (Chapter 3), including anaerobic, autotrophic, and hetero-trophic microorganisms. of oxygen-producing, photosynthetic life. There have been several accounts disputing the biotic origin of these fossils (Brasier et al., 2002), followed by a series of papers on the geochemistry of the deposits, including the presence of kerogen in the cherts (Pinti et al., 2001) and the use of various techniques, such as Raman spectroscopy, to study the carbon isotopes in the microstructures themselves and to reveal the microfossils in three dimensions (summarized in Schopf et al., 2007b). Some of the difficulties with previous isotopic results on these ancient structures and ways to address these problems are discussed in Marshall et al. (2007). More recently, analyses have shown that the kerogen in the chert is of biological origin (Derenne et al., 2008). The strongest evidence that at least some of the Apex microfossils represent life is the increasing number of reports of structurally preserved microfossils from rocks of similar or slightly younger age—some 14 rock units containing 40 described morphotypes of microfossils (Schopf et al., 2007b). For example, Rasmussen (2000) described filamentous microfossils from the slightly younger Sulfur Springs Group (3.235 Ga) from the same area of the Pilbara Craton in Australia. These organisms were interpreted as living in the rock pores in the shallow subsurface of the seafloor in a hydrothermal environment. 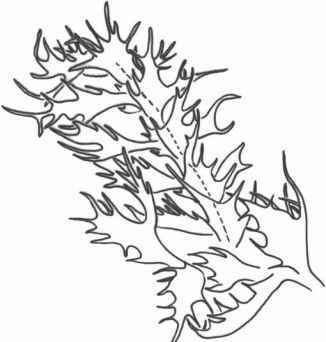 They consist of unbranched filaments, 0.5-2 |m in diameter and up to 300 |m long. The filaments are abundant, occurring in dense groups, with many intertwined. These microfossils are interpreted as being the remains of thermophilic, chemotrophic microorganisms, similar to prokaryotes that occur in those environments today. More recently, Sugitani et al. (2007) described a diverse assemblage of microfossils from black chert in the slightly younger Gorge Creek Group (3.19-2.97Ga, Warrawoona Group), using a combination of morphology (via thin sections) and geochemistry (isotopic analyses of C, N, H, and S). 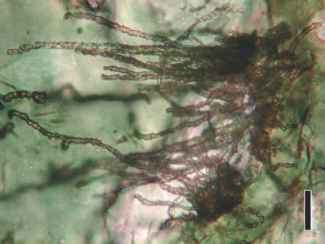 The fossils are an integral part of the rock (i.e., not contaminants) and include four morphological types including threadlike filaments, small spherical structures (FIG. 2.6 ), spindle-shaped microfossils, and film-like objects (FIG. 2.7). The fossils are abundant and all are > 1 |m in diameter, with some filaments extending up to 100|im in length. Perhaps the most interesting fossils are these film-like structures, some of which have small spheres associated with them. Some sheets are folded or wrinkled and range from 50 to >500 |m in size. These may represent parts of microbial mats or perhaps fossilized biofilms (Gall, 1990), which can be especially important in the preservation of many other fossils (Chapter 1). possible anoxygenic photosynthetic microbes. 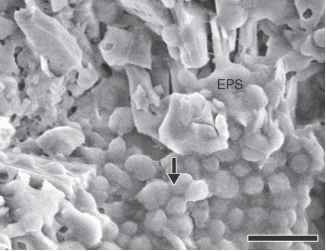 A biofilm with coccoid colonies occurs as a coating on volcanic grains and is interpreted as including chemolithotrophic microbes. Thus, the Kitty's Gap chert biota is not only excellent evidence of a microbial ecosystem that lived at about the same time as the Apex microfossils, but also provides compelling evidence for the presence of ancient microbial biofilms. BARBERTON GREENSTONE BELT, SOUTH AFRICA. Another important source of data on Archean life is the Onverwacht Group (3.55-3.33 Ga) in the eastern Transvaal, South Africa. The younger Fig Tree Group (3.26-3.23 Ga) is from this same area (Lowe and Byerly, 1999; Altermann, 2001). Although a number of spherical unicells have been described from the Onverwacht cherts, many of them are now regarded as questionable microfossils (Schopf and Walter, 1983). Smaller cells, including several thought to be in the process of dividing (Knoll and Barghoorn, 1977), are more likely to represent biogenic remains. Walsh and Lowe (1985) described 3.5Ga filamentous microfossils from the Hooggenoeg Formation (Onverwacht Group). These consist of threadlike filaments <0.2-2.6 pm in diameter. Filaments from the overlying Kromberg Formation are 0.1-0.6 pm in diameter and 10-150 pm long (Walsh and Lowe, 1985). Stromatolites from the younger Fig Tree Group (3.263.23 Ga) provide evidence for the complexity of Archean life (Byerly et al., 1986). More recent studies on the Barberton rocks include the discovery of tubular structures in basaltic glass (Furnes et al., 2004; Banerjee et al., 2006) (see above), the presence of microbial mats (Westall et al., 2006b), and the research of Noffke et al. (2006) on sedimentary structures (see section "Sedimentary Evidence"). Tice and Lowe (2004) described laminated, carbonaceous material that is believed to represent the remains of microbial mats in the Buck Reef Chert (3.416 Ga). Possible coccoid and rod-shaped bacteria, replaced by minerals, have also been described from the Onverwacht Group (Westall et al., 2001), although the biogenicity of some of these structures has been questioned (Altermann, 2001). the bottom of a body of water (Riding, 1999). 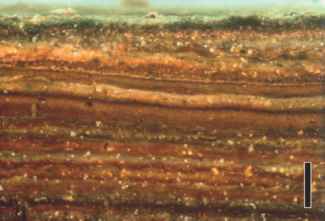 Although the term stromatolite has been used for layered structures of abio-genic origin, we will use the definition as discussed in Riding (1999) to include structures that are assumed to be biogenic. Stromatolites were widespread in the Precambrian, beginning at ~3.5Ga (Buick et al., 1981) and continuing through the Proterozoic. They are much less common in the Phanerozoic, although they occur in all periods as local reefs; stromatolites are found today only in relatively restricted environments. Modern stromatolites are formed by aggregations of microorganisms, most commonly cyanobacteria, but also green algae (Chlorophyta) and diatoms (Bacillariophyceae) that trap, bind, or precipitate calcium carbonate (CaCO3 ) in thin layers. Stromatolites are lithified by calcium carbonate when "living," but most of the Precambrian fossilized stromatolites were taphonomically replaced with silica (for more information on stromatolites, see Walter, 1976; Riding, 1991; Bertrand-Sarfati and Monty, 1994). upper surface of the columnar calcium carbonate. When the colony dies, the calcareous structure may persist as evidence of the organisms that formed it. Stromatolites were widespread and important during the Precambrian, as it was a microbially dominated world until the latest Proterozoic. 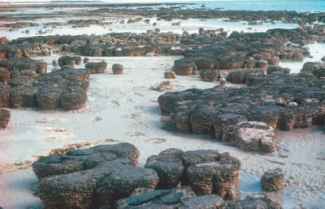 Some Proterozoic oil deposits found associated with stromatolites are thought to be microbially produced. Some fossil stromatolites contain remains of the microorganisms that formed them, but more often only the layered structure is preserved. If the organisms themselves are preserved, it is usually the result of secondary silicifi-cation of the stromatolite. Unlike later stromatolites, the Paleoarchean ones were probably produced by anoxygenic (non-oxygen producing) microorganisms, a hypothesis that is supported by isotopic studies of Archean rocks and by modern experimental work (Bosak et al., 2007). over a distance of several kilometers in the SPC (3.430Ga). From a detailed sedimentologic analysis, these authors suggested that the stromatolites were best developed in relatively restricted parts of a peritidal carbonate platform (Allwood et al., 2007). The morphologies range from typical, laminated dome-like stromatolites to conical forms and wavy or bumpy (egg carton) types (FIG. 2.16 ) . A biogenic origin of these stromatolites is supported by the fact that all have morphologies similar to known microbialites (microbially induced sedimentary structures) and none can be explained by abiogenic development. The diversity of forms present and their extended distribution suggest an entire ecosystem composed of microbial communities. A number of other sedimentary and organosedimentary structures are often used as evidence of past microbial life. The general term for such structures is a microbial-ite, which is defined as an organosedimentary structure formed by the interaction of microbial communities with sediment. This interaction can include trapping or binding sediment, or biologically mediated calcification (Burne and Moore, 1987; Riding, 2006b). Stromatolites are thus a type of microbialite—one that has a finely laminated internal structure. Thrombolites are microbialites with a clotted internal )exture. Microbially induced sedimentary structures (also called MISS) also provide evidence of past life (Noffke et al., 2001). Noffke et al. (2006) describe evidence of microbial mats in the form of wrinkle structures, desiccation cracks, and roll-up structures in 3.2 Ga sandstone rocks from South Africa. Similar structures have also been described from the Mesoarchean (2.9 Ga) of South Africa (Noffke et al., 2008) and from various localities throughout the Precambrian (Simonson and Carney, 1999; Schieber, 2004). These Archean sedimentary features are comparable to those observed in similar modern environments and form via the stabilization of sediment by overlying microbial mats. The Archean structures formed in a tidal flat setting and resemble modern mats in cross section, showing a laminated structure; carbon isotope values are also consistent with a biogenic origin (Noffke et al., 2006). Cyanobacteria are the most common organisms involved in the formation of similar modern sedimentary features, but whether these Archean mats were formed by cyanobacteria, or whether they were oxygenic or anoxy-genic cyanobacteria, is not yet known. If the mats were formed by oxygenic photosynthesizers, then they would represent an early source of atmospheric oxygen on Earth (Noffke et al., 2006).